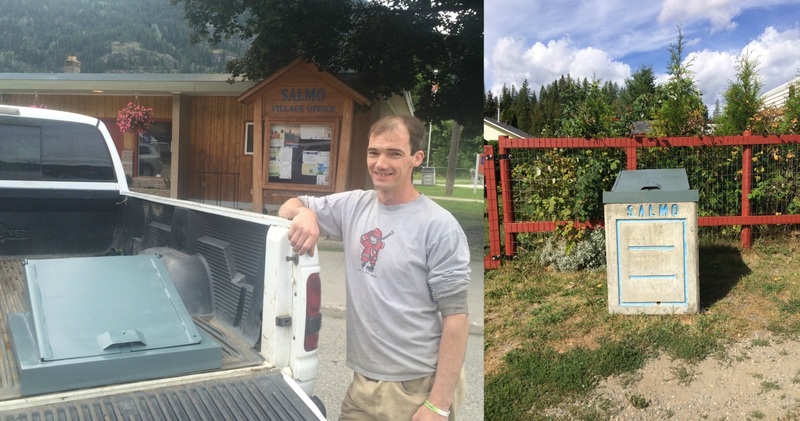 The Village of Salmo has found a made-in-Salmo solution to the need to convert a dozen Village concrete garbage containers to bear-resistant bins at a fraction of the cost of purchasing new bear-resistant bins. The conversion was completed last week. All 24 Village containers are now bear-resistant. The request for proposals acknowledged that the Village had limited funds and asked bidders to create a custom bear-resistant cover for the existing bins. Local contractor and entrepreneur Will Wadsworth created the winning prototype and carried out the conversion at a fifth of the cost of the next highest bidder. Council took action in 2016 to minimize bear attractants and avoid the destruction of bears and other wildlife in the Village limits by passing a resolution in April to convert the remaining half of Village bins to bear-resistant containers. This followed a difficult year in 2015, where conservation officers destroyed four bears in the Village limits. In the past 30 days, there have been eight sightings of bears reported to WildSafe BC in the Village limits. No animal destruction has been specified in their reports.